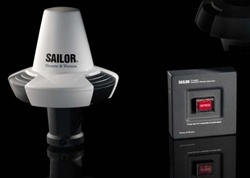 Vessel Monitoring System (VMS) – The SAILOR 6150 mini-C Distress provides a number of advanced tracking functions. With GeoFencing you can divide relevant sea areas into a range of geographical zones meaning you can define special areas of interest where specific reporting intervals come into effect and also be alerted when your vessel is out of its designated zone. Two-Way Messaging – With the SAILOR 6150 mini-C Distress it is easy to send various types of text messages. Simply connect a PC to the terminal and you are ready to receive Enhanced Group Calls or send catch reports at all times. You can also exchange e-mails, fax, SMS, and special messages to other Inmarsat-C users. Free Enhanced Group Calling (EGC) – EGC can improve safety and at sea, it can include severe weather warnings, drifting goods notifications and distress information about nearby ships or general information from flag authorities on shore (SafetyNet/FleetNet). EGC reception, configuration are done easily via the free easyMail PC program or Message Terminal from Thrane & Thrane.